Good morning everyone! Well my busy week has started! Yesterday was a fun day filled with stitching but I did have to leave early to complete some unfinished projects. Thankfully I got most of them done before my son and husband got home! Tonight is Stamp Club! I am looking forward to seeing the gals again!! Today's card was one that I had done a while ago. I hadn't photographed it and it must have been in a place where it got a little warped and neglected :(. I wanted to show it so I am posting it anyway. There you have it! 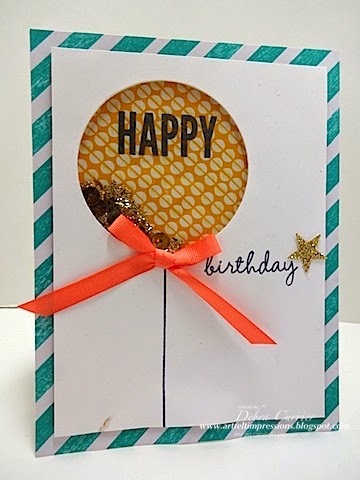 A fun shaker card for a birthday! Thanks for stopping by and have a super day!